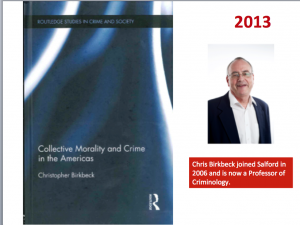 This book has just been published by Sage Publications, and is authored by Dr Tina G. Patel, who is a Senior Lecturer in Criminology at the University of Salford. Race and Society provides a thoughtful and critically engaging exploration of some of the key issues around race and racialisation, which have arisen in what is considered to be a highly diverse and complex society, in which claims about a post-race condition have problematically dominated the race/racism agenda. With a progressive approach emphasising the social construction of race issues within a post-racial era, moving away from essentialist and polarized explanations of raced interaction, the book provides an introduction to the main concepts and key theories, including their post-developments; it focuses on the processes and impact of racial categorisation in contemporary society; highlights the intersectional and multifaceted nature of race and related conceptualizations; and, illustrates how race has morphed into newer forms of categorizations. 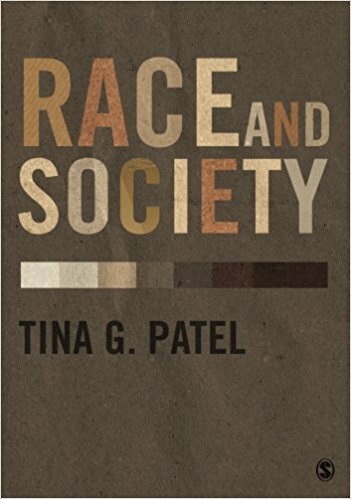 The chapters include: Categorizing Race; Understanding Society; Identity and the Place of Race; Race in Social Institutions and Organizations; Human Rights, Equality and Legislation; and, Researching Race and Society. The book is packed with topical examples and international case studies to engage readers, including the the ‘blacking up’ of Rachel Dolezal, the Alphaville gated community in Brazil, the Jyoti Singh Pandey case, racism in football. The book will be useful for all those with an interest in race and racialisation processes. 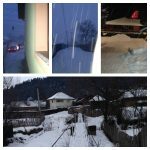 During the night of Saint Andrews (end of November), Romanians believe that bad spirits (the vampires!) may attack at night, which is why most households will hang a garlic clove on their front gate to keep Dracula away 😕 . Then, on the 6th of December we celebrate Saint Nicholas, one of the most awaited holidays of the year especially by children. 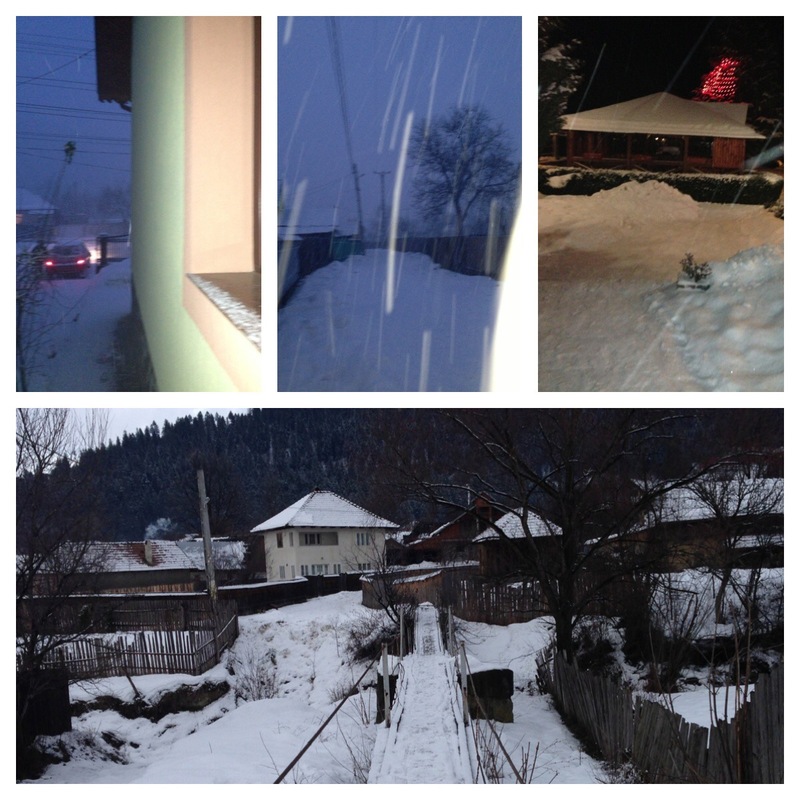 In the Romanian culture, Mos Nicolae (Saint Nicholas) comes with gifts on the night between December 5 and December 6. He places gifts in children’s polished boots, apart for those who have been naughty. Instead, they receive a stick (trust me I’ve got the stick 😉 ). Apparently, a snowy day means that the Saint has shaken his beard for the winter to start. For me, Christmas celebrations generally get started in early December. In the first week or so I find that if the excitement of eating my advent calendar chocolates hasn’t triggered those festive feelings, then going along to a local Christmas event is sure to do the trick! As a child, these early December outings were all about queuing up to meet Father Christmas and pestering your parents for sweet treats, like hot chocolate topped with a mountain of whipped cream and marshmallows. As an adult, it’s now much more about sharing a spiced cider or mulled wine with friends at the Christmas markets. Regardless of which drink is in hand, this is typically when my favourite festive moment happens: the countdown to the Christmas lights switch on. A close second favourite has to be decorating the Christmas tree, which usually happens around the same time. 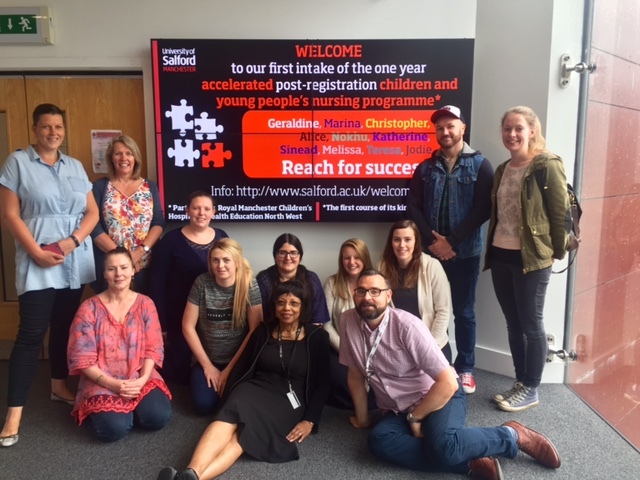 Welcome to our first intake of the one year accelerated post-registration children and young people’s nursing programme! Our students joined us today for their induction week after struggling in against monsoon conditions, traffic jams and cancelled trains! A delicious lunch and relaxed atmosphere helped the day progress and set the scene for an informative week. Geraldine, Marina, Christopher, Alice, Katherine, Sinead, Melissa and Teresa had a very informative first day at the university after a full week of induction at our partner organisation; Royal Manchester Children’s Hospital and are excited about the coming months as they develop their children and young people’s nursing knowledge and skills. Over the last six years I’ve helped almost 2000 PhD candidates prepare for their viva. It feels great to be directly helping people with what feels like a big problem: how do you prepare for the viva well? 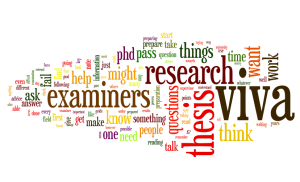 Despite three years or more of research, candidates can often approach their viva wondering, “Is it going to be OK?” They worry that examiners might be awful, or that nerves might get the better of them. So what can you do to approach the viva with confidence? The Stats Are On Your Side: A few years ago I did some research into viva experiences, and the vast majority of people have positive experiences. Their viva isn’t incredibly long, most people get minor corrections (or none at all) and generally the viva is quite enjoyable. Knowing that most people have a good time can give you some confidence that you will too. Practise Confidence: As a directive it sounds almost as useful as “don’t worry!” But research suggests that we can practise being confident. Check out this TED Talk by Amy Cuddy to see examples of power posing and learn about how it could help you be confident. Practise Answering Questions: One of the best things that you can do to feel confident for the viva is practise answering questions. Think about having a mock viva, make opportunities to give seminars where you can take questions – even having coffee with friends who can ask you about your work – all are great ways to gain practice and confidence. The Significant, Original Contribution: PGRs are told throughout their PhD that they have to produce a significant, original contribution to knowledge. Heading towards submission and the viva, candidates can worry about whether or not they’ve done it. But they wouldn’t have got to the end of their PhD if their supervisor and others didn’t think their work was significant! You can take confidence from reaching this final hurdle. It’s OK to feel nervous before the viva, but it’s right to feel confident about your work. You wouldn’t be at the viva if you weren’t meant to be. Anyone can feel nervous, but there is a lot that you can do to be confident. Thanks for reading! If you need some more help or resources check out the Viva Survivors Podcast, my project where I interview PhD graduates about their research, viva and life afterwards. I’ve written two ebooks on viva preparation, and the first one is now available in print too. 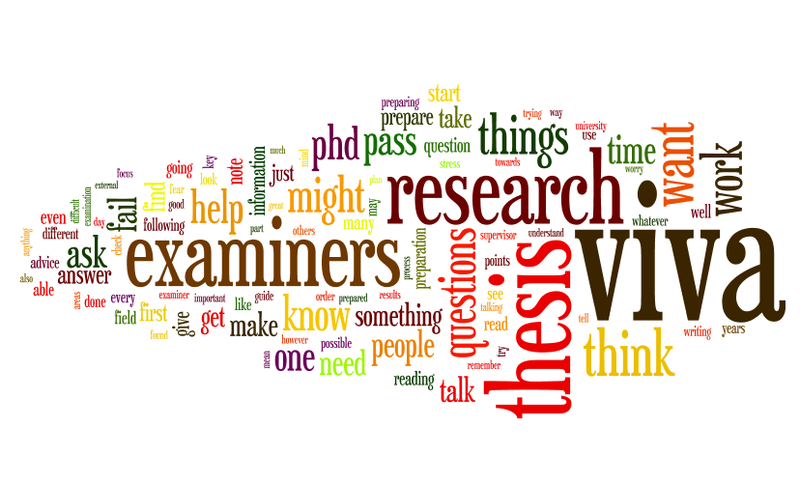 Finally, I’m running a Viva Survivor workshop on June 29th in Manchester to help PhD candidates prepare well for their viva. Places are limited, check here for more details. 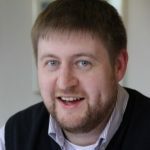 Dr Nathan Ryder is a freelance skills trainer who specialises in helping PhD candidates prepare for the viva. Find out more about his work at his website and the Viva Survivors Podcast. The Salford Postgraduate & Staff Research Training (SPoRT) programme runs ‘Preparing for the viva’ workshops on a regular basis and you can access the Good Viva video at any time during your studies (login required). There is also support for you from within the School in preparing for your viva. Contact Louise Brown for more information on how to access this support. 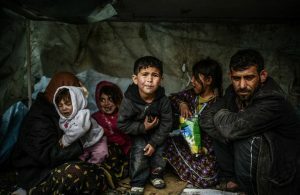 The Sustainable Housing & Urban Studies Unit (SHUSU) are delighted to introduce a series of exciting events taking place at the University of Salford to celebrate Refugee Week. This exhibition displays photographs taken during the University of Salford’s trip to the ‘Jungle’ in Calais as part of the ‘Salford to Calais’ project. At this opening event, the photographer and members of the ‘Salford to Calais’ team will share their experiences of visiting the ‘Jungle’ and the resilience and community spirit that they witnessed during their time in Calais. More information about the exhibition and how to register for launch event can be found here. Following the opening event, the exhibition will be on display all through Refugee Week in the Reception and on the Concourse (first floor) of the Allerton Building. ‘Asylum Monologues’ is a theatre performance providing a first-hand account of the UK’s asylum system in the words of people who have experienced it. The script is performed by members of Actors for Human Rights, a campaigning project of Ice & Fire Theatre, which aims to give a voice to people affected by contemporary human rights issues. More information and how to register can be found here. 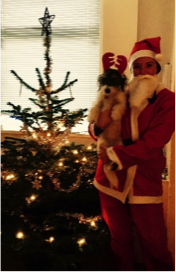 Kate Smith is a Research Fellow (asylum and migration) in the Centre for Applied Childhood, Youth and Family Research, at the University of Huddersfield. Drawing upon her ESRC funded research with women seeking asylum, this seminar will explore the stories of seventeen asylum seeking women, opening up a critical space that highlights the importance of resistive stories and enriches our understanding of the diversity of forms of resistance. More information and how to register can be found here. Guest speakers from across the North West will discuss and debate the impact of the new Immigration Act 2016, focusing specifically on the potential legal, health, education and community implications. Speakers include Denise McDowell (Greater Manchester Immigration Aid Unit) and Rebecca Murray (Article 26). More information and how to register can be found here. Join us to celebrate Refugee Week! Before I realised that I couldn’t afford to spend so much time there I used to be regular visitor to Waterstones on Deansgate in Manchester; my office was in the same block as Waterstones and it was a great place to go at lunch time to quickly refresh my brain and consequently I attended several of their book signing sessions and readings from authors. 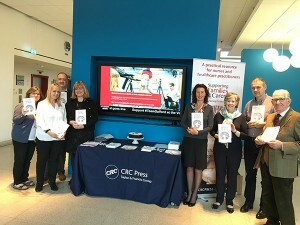 In terms of excitement those sessions paled compared to my anticipation of the launch of Julie Wray and Mary Braine’s book in the Allerton building yesterday. Had Julie not invited me I’d have gate-crashed it! I’ve written before about my involvement with the Users and Carers conferences and its associated support group and how much I enjoy the conferences, the effect they have on student nurses and how invigorating they are to me. It’s inspiring to consider that this book, which draws on experiences from Users and Carers, will play an important part in the education of future generations of nurses and healthcare professionals. That’s an amazing legacy Mary and Julie! The legacy of the Users and Carers group was emphasised by the members who attended yesterday’s event. Former GP and founder member Joe McShane talked to us about how he was ill prepared to become a carer after retirement, initially for his wife and latterly for his daughter. Former Salford Carers representative and Users and Carers stalwart Helen Hills spoke of her new role leading a group of charities. And then there were ‘newbies’ like Farida Anderson and me, both relatively new to Users and Carers but both committed to its future. There were several highlights throughout the event, the first being entirely personal and wholly unexpected (as you can tell from the video below). I played a very, very small part in this book and consequently was staggered to be presented with a dedicated copy of it by Mary and Julie. 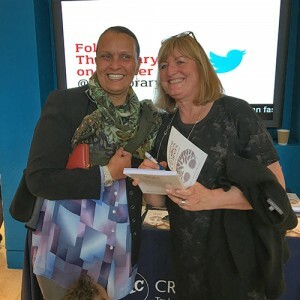 I was further amazed after the event when Julie told me she was using my contribution to the book in her teaching and that her colleagues in Finland had asked to use it in their teaching too! 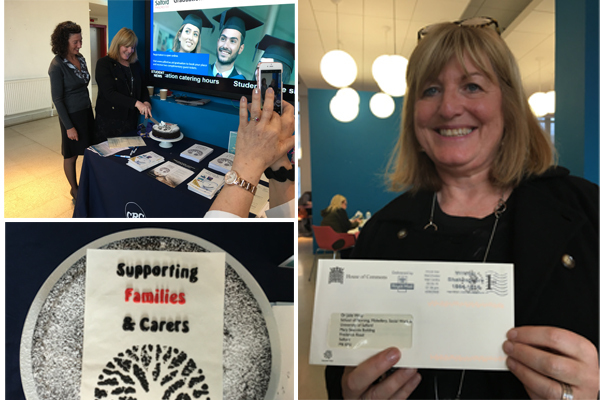 The second highlight was Julie’s home made chocolate and Guinness cake which was beautifully finished with an icing representation of the book’s front cover made by Anthony, one of the lecturers from the University. And so to the third highlight, midway through the morning Julie disappeared to collect a letter from the House of Commons! It was a very supportive message from local MP Barbara Keeley and its arrival made me appreciate the impact of the book would be felt beyond the academic world. 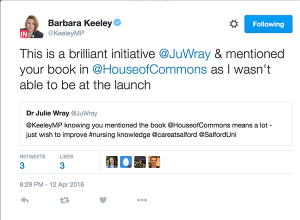 A point reinforced by Barbara Keeley’s tweeted message of support later in the day. Apart from Julie’s cake and rather too many almond Danish pastries, what else did I get from the day? A realisation that no matter who we are, whether a professor, doctor, student nurse, patient or carer we can all inspire in our own way and that each day should be a new learning experience. A new collection of posters, outlining the history of sociology teaching and research at Salford, is on display in the Allerton Building. Sociology was first taught at the University of Salford (then the Royal College of Advanced Technology) for a degree-level qualification in academic year 1963-64. Its first professor, W. H. (Bill) Scott, was a leading industrial sociologist who specialised in the mining industries so central to life in Lancashire in the nineteenth and twentieth centuries. He was succeeded in 1970 by Lorraine Baric, the first woman professor of sociology in the UK. A tireless networker and administrator, she encouraged the growth of programmes in sociology and the social sciences over the following decade. The collection, made up of slides sketching the accomplishments of staff and students over a fifty year period, was developed by Professor Chris Birkbeck and Professor Greg Smith to mark the 50th anniversary celebrations of the Sociology and Criminology group in 2013-14. The posters feature student and staff photos, programme handbooks, class lists, international conferences and seminars, and some of the many books and articles produced by staff over the past half century. The display builds on the archival research of Professor Steve Edgell, who initiated the History of Sociology at Salford (HoSS) project in 2008. HoSS has digital records covering numerous aspects of staff and student life. Sociology is sometimes described as an ‘exporter’ subject whose concepts and methods are adopted by other academic disciplines. Sociology at Salford has always been porous at its edges, embracing closely related subjects such as anthropology, cultural studies and criminology that employ sociological ideas yet are distinct forms of inquiry in their own right. 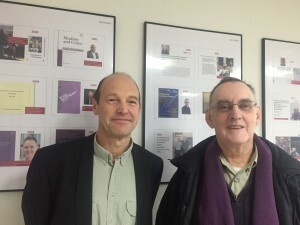 The posters chart the changing trends in sociological teaching and research through the lens of how it was done at Salford and how sociology adapted and flourished following multiple and ongoing internal reorganizations. You can see the collection of posters in the suite of offices for Sociology and Criminology, which can be found at the end of the ‘L’ block corridor on the 5th floor of Allerton Building. If anyone reading this has any material that would enhance the HoSS archive it would be appreciated greatly if you would contact Professor Greg Smith at g.w.h.smith@salford.ac.uk or 0161 295 4706. 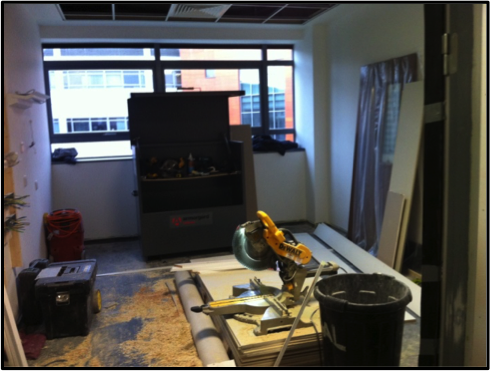 Just over a year ago the plans started to re-develop and expand the simulation areas in the Mary Seacole Building, University of Salford. 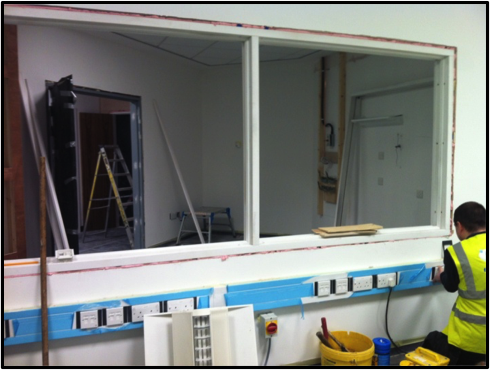 I was given a blank canvas of ‘space’ and along with colleagues from the simulation team we put together a wish list for our new simulation area which would include a nursing and midwifery simulation suite. At first I considered that our thoughts were grandiose, unachievable but the architects soon came back with drawings that had everything we asked for. 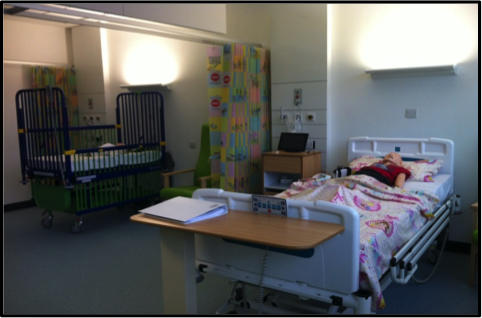 The midwifery suite was comprised of clinical rooms, a control room, delivery suite and a home birth area. The nursing suite included an adult room with 3 beds, children’s room with a bed and cot, two control rooms, two side rooms, a bathroom, a treatment room, a nurse’s station and a day room/relatives room. This was what we asked for and I could not quite believe that all of that would fit into the ‘space’ that we had to work with. Not only that, each bed space had piped air (for oxygen delivery) a nurse call buzzer, emergency buzzer and a bed light. Of course, we were expected to come back with things we wanted changing or items which we weren’t happy with, the architects were consistently accommodating and understanding. The work started at the end of November 2015 during which we arranged site visits to see how the work was progressing. I have to admit I was sceptical as it was still looking like a building site just a few weeks before it was due to be completed. However the work was finished on time in February 2016… In three months the transformation was just amazing! 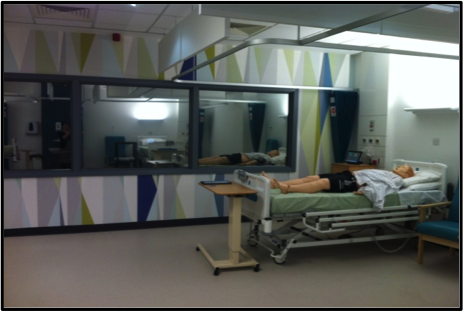 Last week was the first day when we formally introduced the students to our clinical simulation area. The MSc Leading Education in Practice (#SalLeadEd) students were certainly enthused and impressed by what they saw today, the atmosphere in the suite was buzzing (literally) as we simulated a patient arrest for the first time in the new adult room. They commented that it looked like a real hospital and asked did we actually treat patients here? It might be simulation, but it feels, looks and even smells very much like a real hospital.